KINETIK’s project kicks off in September 2011 and the lineup is ready to go during November of the same year. 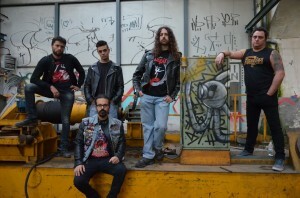 All the five original members, who met under the flagship of Thrash Metal, come from other bands of the metal underground scene of Florence (Italy). Even sharing a common musical baggage the members influence the band sound with diverse metal flavours, spanning from the Teutonic thrash (Kreator, Destruction) to the bay area one (Testament, Megadeth, Overkill), without the intention to stick to any style fingerprint but rather to deliver fresh energy. After one year and half together and some gigs (opening for Striker, Screamer and Evil Invaders at Circus Club) the band released “GREED”, their first 4 tracks EP in July 2013. The entire production, from recording to mastering, was fully self-made by the guitarists Fabio and Massimo at “Centro Giovani GAV” studio and their home studios. In February 2014 Niccolò Parenti decided to leave the band for personal reasons. In May 2014 Luca Oliviero Joins the band as new Bass player. From August 2015 the band starts the first recording sessions of their new full-length album. In September 2015 also Luca leaves the band, and the remaining four members (with Massimo playing bass) play at the first edition of “FISTFUL OF THRASH” opening for bands Asgard and Game Over. In April 2016 Giacomo Pierotti (ex Websters, ex Alcohol Abuse, ex Forze Oscure, ex Iron Small Valley) joins in as bass player. In April 2016 Fabio leaves the band for personal reasons, while KinetiK ends the drums tracks recording. In July 2016 Alessio Corsi joins the band as second guitarist and the line-up is complete again. In August 2016 the band play a gig at the metal festival “Beer Apocalypse Night” in Prato, with some local bands (Speed Kills, Vexovoid, Punition Babek, etc…) . In October 2016, all the instrumental tracks for the next album are done, and the vocal tracks recording starts. In December 2016 KinetiK release an interview to a local radio channel (Radio Diffusione Pistoia), in the “Loud ‘n Proud” program. During April 2017 the vocal tracks are finally complete and, with the help of Lorenzo Bellia (Noia, ex Barbarian), the band starts to work on the final mix of “Critical Fallout”. In June 2017 the band plays at Circus Club of Scandicci with Rawness Obsolete during the release party of “The Human Touch”, last full-length album of Brutal Death band Suicidal Causticity. Finally in July 2017 the band complete the mixing phase of “Critical Fallout” and send the work to the “Tower Studio” for mastering, with supervision and realization by sound engineer Brett Caldas-Lima (Devin Townsend, Cynic, Sacred Reich, Septicflesh and others…). In August 2017, Niccolò Stumpo starts a 20 days tour in USA, with his other band “Barbarian”.